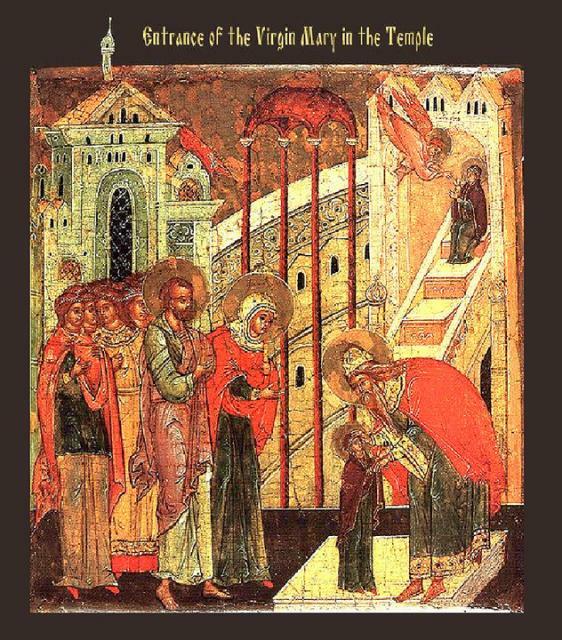 On November 21st in the Holy Orthodox Church celebrates the feast of the Entrance of the Theotokos into the Temple. Leading the procession into the Temple were virgins with lighted tapers in their hands, then the three-year-old Most-holy Virgin, led by her father and mother. The virgin was clad in vesture of royal magnificence and adornments as was befitting the “King’s daughter, the Bride of God” (Psalm 44:13-15). Through her intercessions, O Lord Jesus Christ our God, have mercy upon us, and save us. Amen. Today is the prelude of the good will of God, of the preaching of the salvation of mankind. The Virgin appears in the temple of God, in anticipation proclaiming Christ to all. Let us rejoice and sing to her: Rejoice, O Divine Fulfillment of the Creator’s dispensation! The most pure Temple of the Savior, the precious Chamber and Virgin, the sacred Treasure of the glory of God, is presented today to the House of the Lord. She brings with her the grace of the Spirit, which the angels of God do praise. Truly this woman is the abode of Heaven!